Another class by Americo Cardoso dos Santos Jr. — Do you know an Atypical Fila breed in CAFIB? I doubt it! — CBKC + FCI: Great Dane in the origin of the Fila? I doubt it! Just another desperate attempt to validate the “black fila” that is only accepted by these two clubs, but not in Unifila and CAFIB. I doubt it! — SPFB is the successor of the Fila Brasileiro Club Paulista? Yes. Thank you for the Quasar descendants photos. Regarding your questions about Fila colors, the breed Standard says that hues (color gradations) of yellow may range from (“baio”) buckskin coat (which is the lighter shade yellow) to red (which is the most intense tone) are accepted. It also says that in all these brands there can also be present a grayish shade, and it adds as well, that the ears may be black and there can also be a black mask. The coat of these dogs that have this sort of gray shade is often called smoky “baia” or yellow smoky (or smokey). It is important to remember that Brazil is a country with vast territory, which results in a variety of cultures, cuisines, customs, accents and regional expressions. In several regions, the brindle fur of dogs and cattle is popularly called “rajada” (stripped, similar to brindle), “brasina” (similar to fire coal) or “araça”. “Araça” is the name of a fruit produced by a plant called “araçazeiro”. In many places, in fact, the popular terms “black vinegar” and “gray champagne” are also used. I had never heard the word “cigar” to designate any shade of coat. The term “mineiro brindle” (“mineiro” means to be natural from the Brazilian State of Minas Gerais) does not have a technical nature, it is not even used by CAFIB judges. It is actually used by the “mineiros” to designate the brindle fur considered the most typical, where the stripes are well defined and well spaced. The light gray / silver is currently very unusual, but appeared more often years ago, primarily in Filas from the ancient lineages from Kennels Parnapuan and Jaguara. On the other hand the color called “Isabel” was extensively mentioned in ancient classics of Brazilian literature to describe a certain coat of horses. It is (literally) a “dirty” white because the name of this shade was originally inspired by the Austrian princess Isabel Carla Eugenia, during a period of sieges and battles, who spent months without changing her dress and underwear, which were originally in white color. Note: My tanks to Olegário Bretas (Canil São José da Lapa – MG) who translated Americo`s answer. 209. Uncle Chico, do you know any Atypical Fila breed by CAFIB? Dear friend, I do not know any Atypical Fila in the CAFIB squad. Especially because these dogs are disqualified by the CAFIB Analyses of Phenotype and Temperament (AFT). 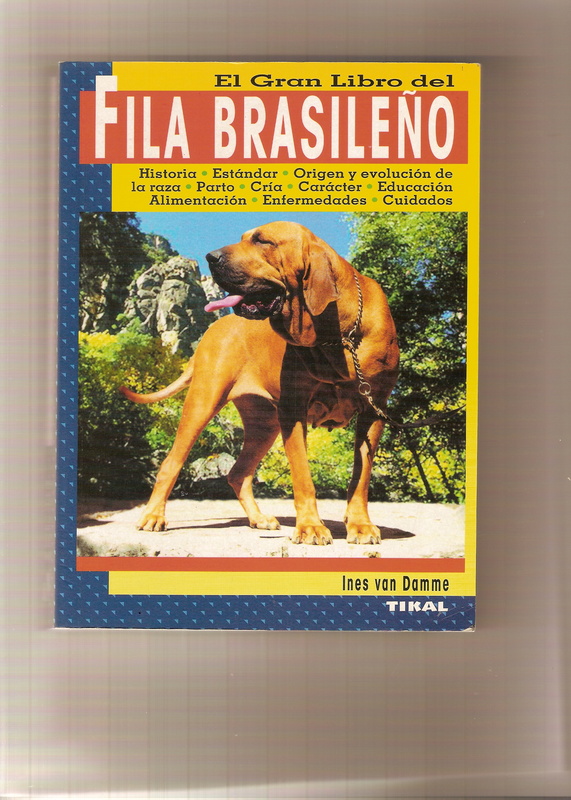 You can read about the importance of the AFT in English by clicking http://www.filabrasileirochicopeltier.com.br/fila-brasileiro-filas.html . As far as my knowledge goes, CAFIB is the only Fila club that makes this kind of strict control (AFT). 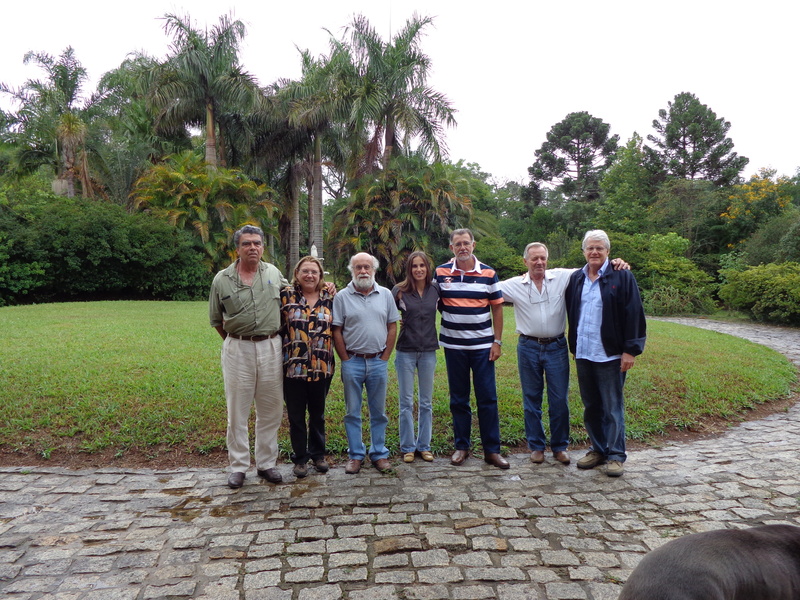 The SPFB and/or the ” Fila Brasileiro CBKC Council” (CBRFB) while Roberto Sene was its president tried unsuccessfully to institute the APR (Apt for Reproduction, ie, a certificate of approval for breeding). But suffice to say that some breeders afraid of having their dogs disapproved in such examination tried to invent a kind of “Optional-APR” (see in http://www.filabrasileirochicopeltier.com.br/novos/30_116/materia.html ). Ie, is the famous “fool me because I like”, so common in the culture and habits of Brazilians. But that does not work in the case of breeding a Purebreed dog, which has a predetermined Standard and accepts no mestizos / mix breeders dogs. Alias ​​FCI, and therefore CBKC, also should not accept mestizos / mix breeders dogs because its Regulation is very clear concerning breeding, registration and exhibition of purebred dogs only. Ie: no mongrels!!! Just read in FCI Status “Article 2 – Objectives” clicking http://www.fci.be/uploaded_files/97-2009-annex1-en.pdf . Ie, many people mistakenly believe they are very important Fila breeders, use to say that they own great champions, buy a lot of propaganda and advertising in magazines, post lots of pictures on the Facebooks, but are actually just breeders of a “mestizos” or even Brazilian Mastiffs (just click in English http://www.filabrasileirochicopeltier.com.br/novos/pergunte_chico_3/materia_eng.html ) . Important: I would like to take this opportunity to clarify that the pictures available on the web are legally considered in the public domain, especially for a site (http://www.filabrasileirochicopeltier.com.br/) and a blog (https://filabrasileirochicopeltierblog.wordpress.com/) educational and instructive as mine. Brazilian law permits this use, then you need not to worry about this fact. 210. Uncle Chico it is true that CBKC, with support from the FCI, was trying to enter in the formation of the origin of Fila, the Great Dane ? 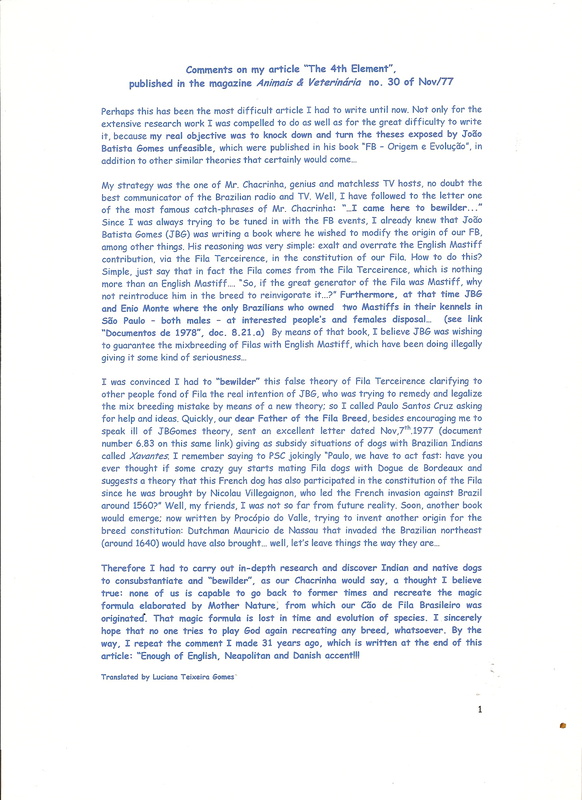 Some breeders are saying to me that this “crazy” allegation would be an attempt aimed in order to validate the “black-fila” – from illegal miscegenation of Pure Filas with black Great Danes – whose records and pedigrees are in CBKC and FCI Stud Books, but that neither CBKC or FCI, nor its affiliated clubs, can explain. Do you believe in this “madness”? No, I do not believe. Sergio Castro, president of CBKC and Rafael Santiago, president of the FCI, are not directly involved in the mix-breeding, unlike other leaders of CBKC and FCI. So neither of them will soil their history with a disastrous invention like this. Both inherited the very serious problem of Fila miscegenation of his predecessors and, unfortunately, not yet learned how to administer it and solve it. Despite having received numerous, serious and viable solutions. 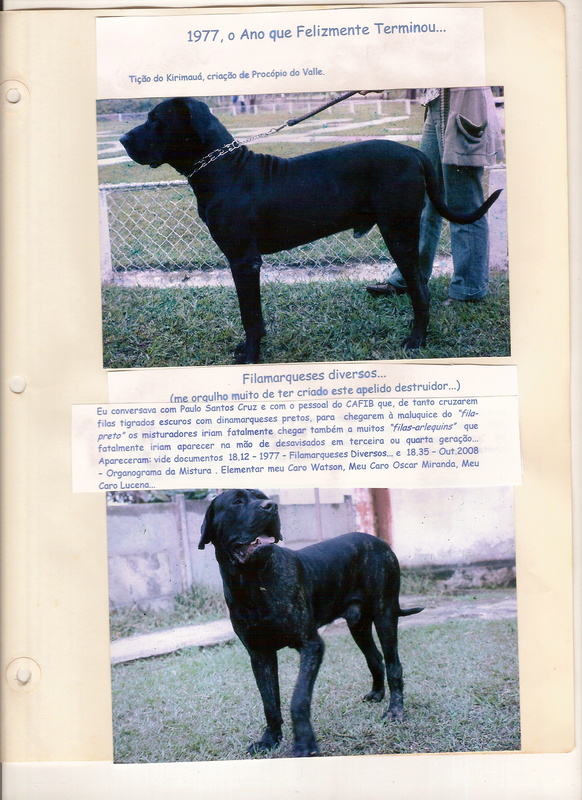 Even the journalist and all rounder CBKC judge, Paulo Godinho, suggested in his book the organization of the Black-fila Breed, i.e., a part of the Fila Brasileiro Breed (*). Or received from myself, as I have simply suggested the organization of Mastin Brasileiro Breed in his Varieties 4 (read in English by clicking http://www.filabrasileirochicopeltier.com.br/novos/pergunte_chico_3/materia_eng.html ). (*) Note: read on page 368 of the Paulo Godinho`s book: “Nothing is more mestizo / mix breed than a “black-fila” …”. I think Sergio Castro and Rafael Santiago will never sign nonsense like this. I do not see these two presidents changing and reinventing the Fila Brasileiro History as use to happen in totalitarian countries that change their history to validate their mistakes. Certainly this news must come from breeders or advocates of so-called “black-fila” or people who do not like Fila Brasileiro. phenotype characteristic in the South of the Brazilian State of Minas Gerais. Brazil, principally the South Minas Gerais in search of Pure Fila. 5. 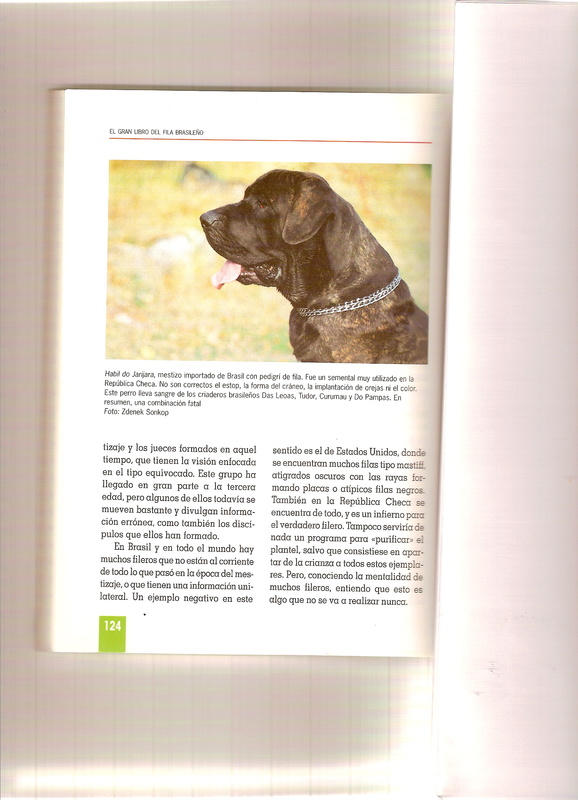 By the way, the journalist Paulo Godinho did not lost his time to mention in his book the false thesis invented by João Batista Gomes, former president of the Club Paulista do Fila Brasileiro (see photos of João Batista with his English Mastiff by clicking http://www.filabrasileirochicopeltier.com.br/fotos/1843.jpg ), SPFB predecessor, who intended to validate the mix-breeding of Filas with English Mastiff, claiming that Fila would be a descendant of the Fila Terceirense, which in turn would be the “poor cousin” of his Shakespearean relative, the English Mastiff .. . Much less Paulo Godinho wasted his time with another false theory invented by Procópio do Valle, also known as the “The Father of Black-fila” (see by clicking http://www.filabrasileirochicopeltier.com.br/fotos/1816.jpg ), which in his turn tried to sell the idea that Fila had in its formation and origin the Dogue de Force Rare. Both theses obviously do not present any prove or at least simple evidences, since does not show any documents or evidence that these dogs were sometime in Brazil. 6. Incidentally, this pseudo theory that preaches via the Dogue de Force Rare the existence of the Great Dane in the origin of the Fila has been unmasked even mathematically because the 10 “black-filas” mentioned by Procópio do Valle in his pseudo thesis were actually only 6, with a huge and extreme consanguineous, which curiously does not generate any black color descendant for 26 years, and then started to appear magical and mysteriously in the Kennel Kirimaua located in Juiz de Fora. 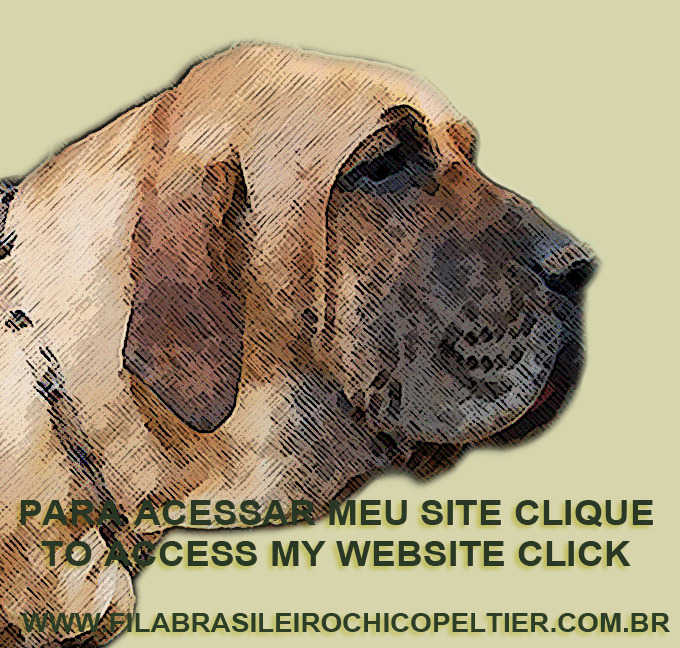 Precisely the kennel owned by Procópio do Valle himself … Just read and study the menu of my site entitled “Black-fila x Pure Fila” clicking http://www.filabrasileirochicopeltier.com.br/7.html . I also suggest reading http://www.filabrasileirochicopeltier.com.br/novos/30_7/materia_eng.html and http://www.filabrasileirochicopeltier.com.br/22-fila-brasileiro-3ENG.html . In conclusion, one more distasteful “story” invented to protect stocks of “filas-mestizos” produced outside the law and with the approval of former BKC, as explicitly and openly admitted by its former president, Eugenio Henrique Pereira de Lucena, in a letter handed to Christopher Habig, former vice president of the FCI (read in English https://filabrasileirochicopeltierblog.wordpress.com/2012/08/25/post-n-33-the-importance-of-chris-habig-sent-aug-24th-2012/ ) and myself addressed to Molosser Magazine of Germany (see by clicking http://www.filabrasileirochicopeltier.com.br/10-Documentos-de-1980-a-1983/10-14.jpg ); as well in the book of Antonio Carlos Linhares Borges (see the original by clicking http://www.filabrasileirochicopeltier.com.br/11-Documentos-1984-ate/11_20a/materia.html and its translation in http://www.filabrasileirochicopeltier.com.br/novos/11_20/materia_eng.html ). You can write: I doubt Sergio Castro and Rafael Santiago sign a stupidity like this! 211. 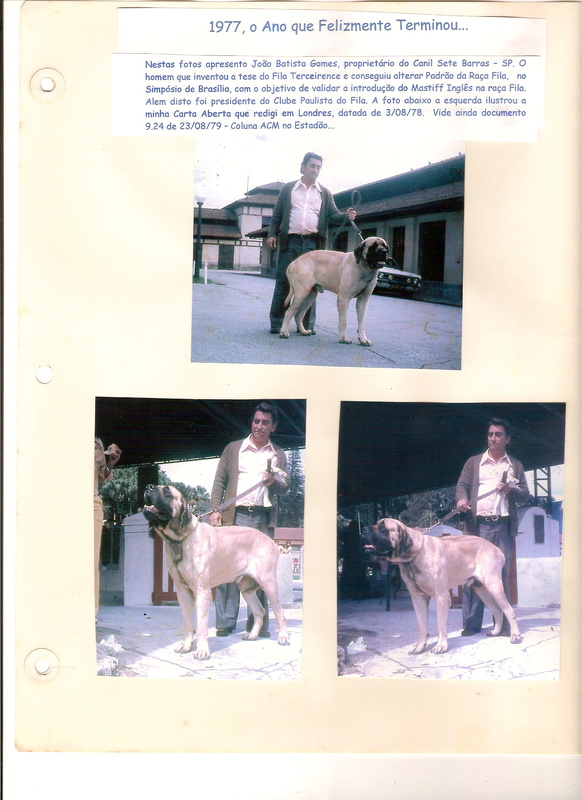 Uncle Chico, why you said that SPFB is the successor of the Clube Paulista do Fila Brasileiro, which had as its most influential president João Batista Gomes, who raised English Mastiff (see by clicking http://www.filabrasileirochicopeltier.com.br/fotos/1843.jpg , http://www.filabrasileirochicopeltier.com.br/8-Documentos-de-1978/8-21-A.jpg and http://www.filabrasileirochicopeltier.com.br/9-Documentos-ate-1979/9-24.jpg )? Well, because this information is written in the SBFB own site. Just click “Club History” on the link http://www.spfilabrasileiro.com.br/historia-clube.php and read: “SPFB joined the CBKC as a successor to replace the old Clube Paulista do Fila Brasileiro, inheriting their rights and obligations to CBKC / FCI“. And again: “The old Clube Paulista do Fila Brasileiro (CPFB), became inactive, then the Fila Brasileiro Breed started to be represented in the State of São Paulo by Sociedade Paulista do Fila Brasileiro – SPFB“. How I use to say, Fila breeders should get used to read and study. With the advent of the web all this information is available to everyone. Just be interested and not be afraid to question old dogmas and fallacies from the past (read in English https://filabrasileirochicopeltierblog.wordpress.com/2012/11/10/post-52-uncle-chico-newsletter-no-6-the-great-consolidation-of-truth-best-and-worst-of-2011-sent-dez-9th-2-011/ ). 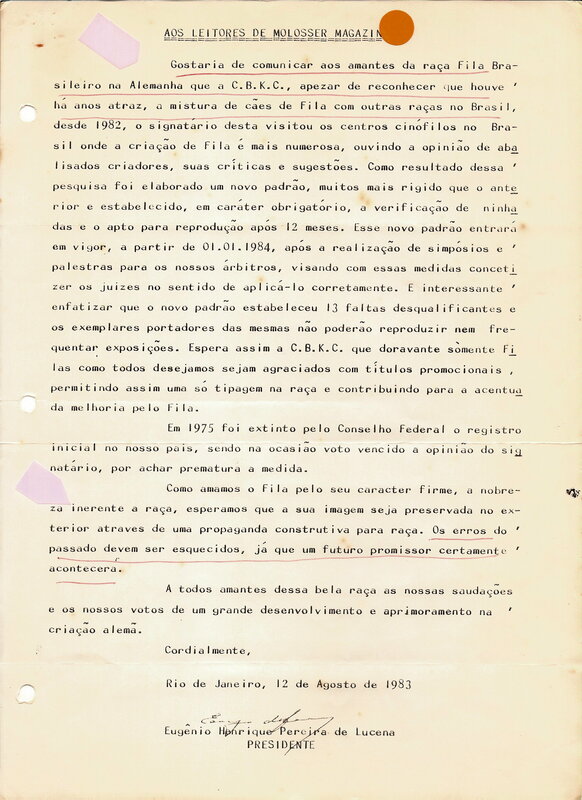 Suffice to say that we have at disposition of all breeder, judges and leaders the CAFIB site (http://www.cafibbrasil.com.br/cafib_historico.html ) with masterpiece articles, such as, “How to distinguish a Pure Fila from a Mestizo” authored by Dr. Paulo Santos Cruz (see in http://www.filabrasileirochicopeltier.com.br/8-Documentos-de-1978/8_30/materia.html ); ), “The Course” also authored by Dr. Paul; the exceptional Americo Cardoso article explaining what it is and how works the CAFIB Analysis of Phenotype and Temperament (see in English by clicking http://www.filabrasileirochicopeltier.com.br/fila-brasileiro-filas.html ); the newspaper “O FILA” edited by our founder Luiz Antonio Maciel (see in http://www.cafibbrasil.com.br/jornal-o-fila/index.html ); we have the book by Ines Van Damme (see in http://www.filabrasileirochicopeltier.com.br/11-Documentos-1984-ate/11-19a.jpg and http://www.filabrasileirochicopeltier.com.br/11-Documentos-1984-ate/11-19b.jpg ); and Paulo Godinho`s book (see in English https://filabrasileirochicopeltierblog.wordpress.com/2013/12/15/post-no-144-uncle-chico-newsletter-55-paulo-godinho-thank-you-for-your-certificate-of-veracity-general-report-on-book-fb-a-gift-from-the-stars/ ) that expose the truth about miscegenation and the terrible failures of BKC, CBKC and FCI, and also my website (http://www.filabrasileirochicopeltier.com.br/) Digite um texto ou endereço de um site ou traduza um documento. with over a thousand documents and over 400 photos and my blog (https://filabrasileirochicopeltierblog.wordpress.com/ ) with more than 150 articles and hundreds of photos. Ie: just keeps breeding mix-breeders-filas, mestizos or mongrels with pedigree, who so wish !!! Mais uma aula de Américo Cardoso dos Santos Jr. – Voce conhece algum Fila Atípico criado no CAFIB? Duvido !!! – CBKC + FCI: Dogue Alemão na origem do Fila? Duvido ! Apenas mais uma desesperada tentativa de validar o “fila- preto” que só é aceita por estes dois clubes, mas não no UNIFILA e no CAFIB. Duvido !!! — SPFB é sucessora do Clube Paulista do Fila Brasileiro ? Sim. trocar o vestido e as peças íntimas, de cor originalmente branca. 209. Voce conhece algum Fila Atípico criado no CAFIB? Importante: aproveito para esclarecer que as fotos disponibilizadas na web são legalmente de domínio publico, ainda mais para um site (http://www.filabrasileirochicopeltier.com.br/ ) e um blog (https://filabrasileirochicopeltierblog.wordpress.com/) educativos e instrutivos como os meus. A legislação brasileira permite esta utilização, logo voce não precisa se preocupar com este fato. filiados conseguem explicar. Voce acredita neste desvario? do quem um Fila preto...”. chamado “fila-preto” ou de pessoas que não gostam do Cão de Fila Brasileiro. 5. Aliás, o jornalista Paulo Godinho sequer perdeu seu tempo de mencionar neste seu livro a falsa tese inventada por João Batista Gomes, ex-presidente do Clube Paulista do Fila (vide com seu Mastiff Inglês clicando em http://www.filabrasileirochicopeltier.com.br/fotos/1843.jpg ), predecessor da SPFB, que pretendia validar a mestiçagem do Fila com o Mastiff Inglês, alegando que o Fila seria descendente de um tal o Fila Terceirense, que por sua vez seria o “primo-pobre” do seu parente Shakespeariano, o Mastiff Inglês… Nem muito menos perdeu seu tempo com outra falsa tese inventada por Procópio do Vale, também conhecido como o “Pai do Fila Preto” (vide clicando em http://www.filabrasileirochicopeltier.com.br/fotos/1816.jpg ), que por sua vez tentou vender a ideia de que o Fila tinha em sua formação e origem o Dogue de Force Rare. Ambas teses, obviamente, carecem de um mínimo de evidencias possíveis e até imaginárias, já que não apresentam nenhum documento e muito menos prova ou evidencia de que estes cães sequer estiveram no Brasil. 6. Alias, esta pseudo teoria que prega via o Dogue de Force Rare a existência do Dogue Alemão (Great Dane ou Dinamarquês) na origem do Fila já foi desmascarada até matematicamente, pois os 10 “filas-pretos” mencionados pelo Procópio do Vale em sua pseudo-tese na verdade eram apenas 6, extremante consanguíneos, que curiosamente não geraram nenhum descendente de cor preta durante 26 anos, até aparecerem mágica e misteriosamente no Canil Kirimaua em Juiz de Fora. 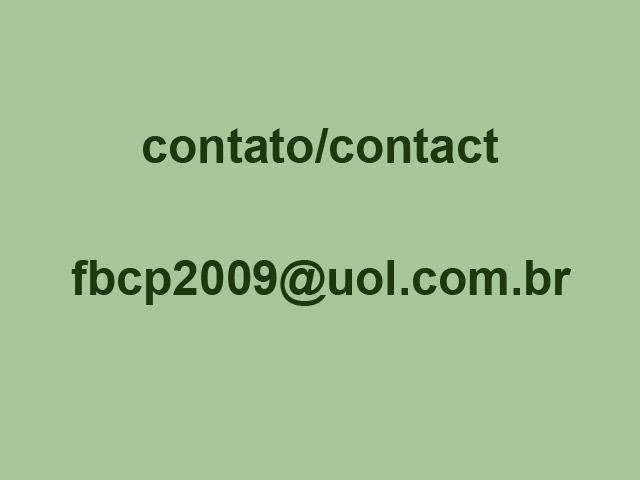 Canil este de propriedade justamente do próprio Procópio do Vale… Basta ler e estudar no menu do meu site intitulado “Cão Preto x Fila Puro” clicando em http://www.filabrasileirochicopeltier.com.br/7.html . Concluindo: mais uma “estória” de profundo mal gosto inventada para proteger os estoques de filas-mestiços produzidos a margem da lei e com o aval do então BKC, conforme admitido expressa e publicamente por seu ex-presidente, Eugenio Henrique Pereira de Lucena, em carta entregue a Christopher Habig, ex-vice-presidente da FCI (vide em português https://filabrasileirochicopeltierblog.wordpress.com/2012/08/25/post-no-34-tio-chico-informa-no-16-a-importancia-de-chris-habig-enviado-em-250812/ e em inglês https://filabrasileirochicopeltierblog.wordpress.com/2012/08/25/post-n-33-the-importance-of-chris-habig-sent-aug-24th-2012/ ) e a mim para ser encaminhada a revista Molosser Magazine da Alemanha (vide clicando em http://www.filabrasileirochicopeltier.com.br/10-Documentos-de-1980-a-1983/10-14.jpg ); assim como no livro de Antonio Carlos Linhares Borges (vide clicando em http://www.filabrasileirochicopeltier.com.br/11-Documentos-1984-ate/11_20a/materia.html ). Pode escrever: duvido que Sergio Castro e Rafael Santiago se prestem a um papelão destes !!! 211. Tio Chico, por que voce afirma que a SPFB é sucessora do Clube Paulista do Fila Brasileiro, que teve como seu mais influente presidente João Batista Gomes, que criava Mastiff Inglês (vide em: http://www.filabrasileirochicopeltier.com.br/fotos/1843.jpg , http://www.filabrasileirochicopeltier.com.br/8-Documentos-de-1978/8-21-A.jpg e http://www.filabrasileirochicopeltier.com.br/9-Documentos-ate-1979/9-24.jpg )? Como digo há anos, os criadores de Fila devem se acostumar a ler e a estudar. Com o advento da web toda informação esta disponível para todos. Basta se interessar e não ter medo de questionar antigos dogmas e falácias do passado (vide em português https://filabrasileirochicopeltierblog.wordpress.com/2012/11/10/post-no-51-consolidacao-das-respostas-as-tolices-e-mentiras-dos-nams-melhores-e-piores-de-2-011-data-9-12-1/ e em inglês https://filabrasileirochicopeltierblog.wordpress.com/2012/11/10/post-52-uncle-chico-newsletter-no-6-the-great-consolidation-of-truth-best-and-worst-of-2011-sent-dez-9th-2-011/ ).
) com mais de mil documentos e mais de 400 fotos e meu blog (https://filabrasileirochicopeltierblog.wordpress.com/ ) com mais de 150 artigos e centenas de fotos. Ou seja: só continua criando fila-mestiço com pedigree de Fila, quem quer !!! As a request received from CAFIB Board of Directors, which will soon publish their official Circular on CAFIB website, I would like to inform you all that last Saturday, Feb. 15thMariana Campbell and myself, who was one of the CAFIB`s mastermind. Unfortunately could not attend the following CAFIB founders: Luiz Antônio Maciel, with a family commitment in Guarujá and Roberto Maruyama who received 40 students to be graduate in his Academy. 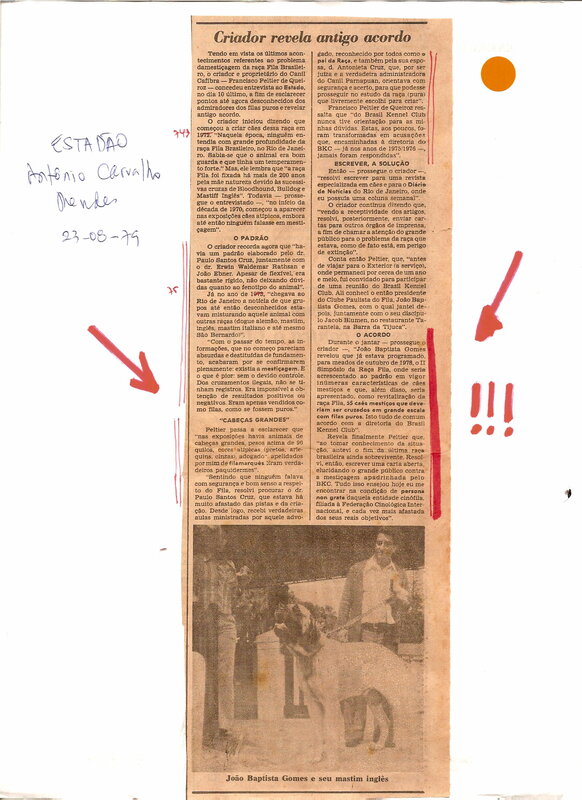 Besides these, cannot attend our member since 1987, Jonas Tadeu Iacovantuano with family commitments in Guaratinguetá. All these three directors were aware of the major issues of our meting as well as the latest developments. So all mortgaged full support for our decisions and authorized us to keep them in our Board. 2 . The resignation of our Cafib CFO, Carlos Amaral Cintra Filho, after 3 years in this role was accepted. Carlos was CAFIB president for two terms and is CAFIB member since 1980. It has also accepted the resignation of our Cafib General Secretary, Tenisson de Souza Cavalcanti, who was responsible for nearly 10 years for this important Secretariat and is CAFIB member since 1999. Both will continue CAFIB members, and the first still remains as CAFIB Judge. It has also accepted the resignation of Fernando Zanetti, which was requested in a irrevocably and irreversible basis. Ie, Fernando resigned from CAFIB, not only from our board of director, as from our Permanent Advisory Board, as well as CAFIB Judge and member. Note: during the year minor changes may occur in the Calendar above, even with the inclusion of the 7th Expo CAFIB-USA and/or the 98th: National Exhibition of the Fila Brasileiro and 29th Exhibition Guaratinguetá – SP. The first, based on suggestion from our former director Caico Amaral, in our Amparo meeting held last Aug, 31st-2.013, when it was suggested by him and accepted unanimously that our National Expo should not be fixed, but should be implement a rotation among the various cities that host our CAFIB Expos / shows. The criteria for a Regional CAFIB Expo become to National CAFIB Expo will be examined and decided by CAFIB board of Directors. It was also decided that the score of the National CAFIB Expos should be differentiated, as has always been, because the importance of the event. The second change, based on suggestion from our former General Secretary, Tenisson Cavalcanti, in our Guaratinguetá meeting held last Nov, 30th-2.013, when it was suggested by him and accepted unanimously that the number of CAFIB Expos / shows should be maximum of 5, exceptionally more one, in order to meet the request of many exhibitors who complained of various difficulties to participate in so many CAFIB Expos throughout the year. Thus, increasing the competitiveness of the several annual CAFIB championships. Has been decided yet on this occasion that CAFIB accomplish only 5 or 6 Expos / shows in Brazil in the current year and the chosen cities would be decided by our Board in agreement with the Expo organizers. Also that in 2,014 there would be a rotation system with the cities where they were not carried CAFIB Expos / shows. It should be added that with respect to the last National Expo of the year the score will be 50% higher than the Regional ones, to greater interest and contention in the final of the CAFIB annual Championships (best Male, Female, Temperament, Kennel, etc…). Established new criteria for the sponsorship and support of our Expos / shows; judges should restrict the presence of people in the ring of our Expos; requirement of the owners of stud dogs to issue the Certificate of Coverage; indication of a qualified professional with the goal of supporting Francisco Fornel who is for the last 10 years helping free CAFIB, since he is the responsible for our Informatics Sector. Important note: the complete and official information about this first CAFIB meeting will be soon in the CAFIB site ( http://www.cafibbrasil.com.br/ ) . Another CAFIB year preserving the Pure Fila and 36th year anniversary of CAFIB !!! A pedido da Diretoria do CAFIB, que em breve publicará sua Circular oficial em seu site, informo que no último dia 15 na casa de Cleide e Américo Cardoso, situada em Vargem Grande Paulista – SP, cercado por um lindo verde aonde se destacavam as lindas palmeiras, foi realizada a primeira reunião da diretoria do CAFIB deste ano. Participaram alem deste casal que faz parte do CAFIB desde sua fundação os seguintes diretores: nosso presidente e sócio do CAFIB desde 1.980, Luciano José de Almeida Gavião; nosso fundador Airton Campbell; nosso sócio desde 1.980, Pedro Carlos Borotti; nossa “sócia” desde seu nascimento, Mariana Campbell e eu, um dos idealizadores do CAFIB. Infelizmente não puderam comparecer os seguintes fundadores do CAFIB: Luiz Antônio Maciel, com compromisso familiar no Guarujá e Roberto Maruyama que recebia 40 graduados para prestar exame de graduação em sua Academia. Alem destes, não pode comparecer nosso sócio desde 1.987, Jonas Tadeu Iacovantuano, com compromissos familiares em Guará. Todos estes três diretores estavam cientes dos principais assuntos de nossa pauta, bem como dos últimos acontecimentos. Assim, todos hipotecaram total apoio às nossas decisões e nos autorizaram a mantê-los em nossa diretoria. 2. Foi aceito o pedido de saída do cargo de diretor Financeiro de Carlos Amaral Cintra Filho, após 3 anos nesta função. Caico foi nosso presidente por dois mandatos e é sócio do CAFIB desde 1.980. 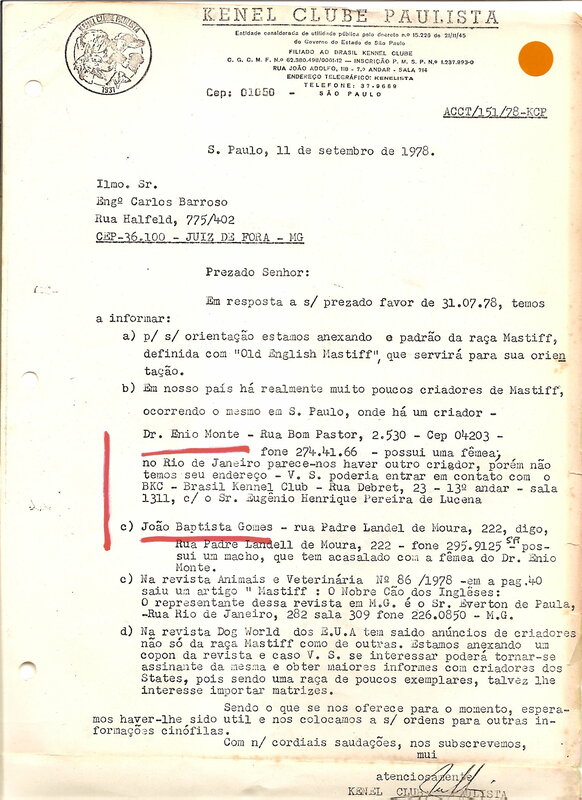 Foi também aceito o pedido de saída do cargo de Secretário Geral de Tenisson de Souza Cavalcanti, que ficou por quase 10 anos responsável por esta importante Secretaria e é sócio do CAFIB desde 1.999. Ambos continuando no nosso quadro de associados, sendo que o primeiro permanece ainda em nosso quadro de Juízes. Foi também aceito o pedido de desligamento do CAFIB de Fernando Zanetti, o qual foi solicitado em caráter irrevogável e irretratável. Ou seja, Fernando se desligou do CAFIB, não só da nossa diretoria, como do nosso Conselho Deliberativo Permanente assim como do nosso quadro de Juízes e de sócio. Airton Campbell, Tesoureiro; Americo Cardoso dos Santos Neto, Diretor de Divulgação e Mariana Campbell Secretaria Geral. 23 de novembro: 97ª Exposição Nacional do Fila Brasileiro e 16ª Exposição de Goiás. – Goiânia – GO – Juízes: Luciano Gavião e Pedro Borotti. A primeira, baseada em sugestão do nosso então diretor Caico Amaral, na reunião do dia 31/08/13 em Amparo, quando foi por ele sugerido e aceito por unanimidade que as Exposições Nacionais não deveriam ser fixas e sim haver um rodízio entre as diversas cidades que sediam as nossas Exposições. Os critérios para que uma Exposição regional passe a ser Nacional seriam analisados e decididos pela diretoria. Foi também decidido que a pontuação das Expos Nacionais voltasse a ser diferenciada, como aliás sempre foram, pela importância do evento. A segunda, baseada em sugestão do nosso então Secretário Tenisson Cavalcanti, na reunião do dia 30/11/13 em Guaratinguetá, quando foi por ele sugerido e aceito por unanimidade que o número de exposições fosse no máximo de 5, excepcionalmente mais uma, para atender a pedidos de diversos expositores que reclamaram das diversas dificuldades para participarem de tantas Expos do CAFIB ao longo do ano. Com isto aumentando a competitividade na disputa dos diversos campeonatos anuais. Foi decidido ainda nesta oportunidade que o CAFIB realizaria somente 5 ou 6 exposições no corrente ano e que as cidades escolhidas seriam decididas pela diretoria em comum acordo com os organizadores e que no ano seguinte, haveria um sistema de rodízio com as cidades onde não foram realizadas as exposições este ano. Cabe acrescentar que com relação a ultima Exposição Nacional do ano a pontuação será 50% maior do que as Regionais para haver maior interesse e disputa na final dos Campeonatos Anuais. Estabelecido novo critério para o patrocínio e apoio às nossas Expos; os juízes devem restringir a presença de pessoas no ringue de nossas Expos; exigência dos donos dos padreadores a emitirem o Atestado de Cobertura; indicação de um profissional qualificado com o objetivo de apoiar Francisco Fornel que há 10 anos ajuda gratuitamente o CAFIB sendo responsável pelo nosso Setor de Informática. Nota importante: as informações completas e oficiais sobre esta primeira reunião do CAFIB estarão em breve no site do CAFIB (http://www.cafibbrasil.com.br/ ). Mais um ano preservando o Fila Puro e o 36º ano de aniversário do nosso CAFIB !! !